A legendary stallion? Only time will tell. But one thing’s for sure: Wertherson’s influence as a sire has been profoundly felt in the show ring, not to mention the breeding shed. An “Elite” Hanoverian stallion with uncommon elegance, Wertherson is the product of a centuries-old breeding program. But his legacy is completely modern in the best sense of the word — and so far, it hinges primarily on his daughters. Wertherson was bred in Germany, by H.H. Buchholz. 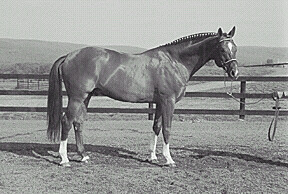 A 1983 foal, he was sired by the Celle stallion Werther, the first winner of the Hanoverian Stallion Award and a stallion whose progeny excelled at so many disciplines that they earned him the title “Versatile Werther.” Wertherson’s dam, the State Premium Walesca, is out of Auskehr, a major Hanoverian foundation mare. Weltdame, a full sister to Wertherson, is also a State’s Premium daughter of Werther, and earned the distinction of a DLG Champion mare (DLG refers to the national body that oversees all the “Duestchland” Warmblood breeds, including, but not limited to, Hanoverians, Holsteiners, Hessians, Oldenburgs, Trakehners and others, so a DGL Champion designation is quite rare and prestigious). But it was in Maryland that Wertherson forged his reputation. In 1986, shortly after his 100 days’ test, the horse was imported to the Eastern Shore by jumper rider Reiner Schmerglatt of Verden Park. Not much is known about Wertherson’s early years at stud, although he did lose an eye during this period and wore a prosthesis for much of his life. Wertherson’s story took a new direction when he changed hands in the winter of 1989. Ironically, it was a Thoroughbred stallion owner, Suzanne Quarles of Mt. Airy, who took the Hanoverian to new levels. Quarles had stumbled on an ad for a stallion in Centreville. A good friend was headed out there to see a young horse, so she decided to go along and take a peek at Wertherson. “I had no intention of buying another stallion,” she maintained. When she walked into the barn, Wertherson was tied to the wall alongside other horses among mares and geldings, in the German fashion. The 16.3h chestnut stallion was so mannerly that Quarles mistook him for a “beautiful gelding” that was being prepared for a ride. When the staff stood him up for Quarles, all she could say was, “Wow!” The horse’s gaits proved even more amazing. “He made a great first impression,” she recalled. Though Wertherson was a model of class and refinement, Quarles was still reluctant to take on another stallion — until her husband asked her “Why not?” Intrigued by the idea of having a stallion who could also compete in dressage, Quarles went back for Wertherson. There was just enough time to advertise him for the coming season, so the deal was sealed. Quarles immediately sent her new purchase to Fred Weber, a top-ranked dressage rider based at Woodvale Farm in Frederick. Wertherson’s aptitude was as marvelous as his gaits were gorgeous. “He went right through the ranks, a level a year,” Quarles recalled fondly. “He was an incredible FEI horse who was nearly unbeatable at Prix St. George and Intermediare I.” Indeed, his FEI career scores average out to a little over 65%. Sadly, Wertherson’s competitive career ended in 1993 when a blow to his “good” eye triggered a bizarre series of problems that, despite an operation, resulted in the complete loss of sight. So, on the eve of some of his greatest accomplishments in the dressage arena, the striking chestnut was retired from competition. During his competitive years, Wertherson had maintained a full book of mares each season, so he was able to make the transistion seemlessly. At first, Wertherson’s breeding business was largely local and East Coast-based. But his popularity gradually spread west, with quite a few clients emerging from California. From the first, it was clear that Wertherson’s legacy would rest with his daughters and granddaughters. As the sire of 11 Elite Hanoverian mares, Wertherson is ranked third in the Hannoverian Stud Book, behind Diamont (b. 1976) and Domingo (b. 1980). Quarles’ own Wertherson get have generally been sold straight off the farm. “They go for between $12,000 and $15,000 as just barely-broken 2-year-olds,” she said. A first-year green hunter by Wertherson recently brought about $300,000, so clearly, the sky’s the limit. Some particularly nice Wertherson foals came from a little mare named Alexandra that Quarles herself owned. “She was barely 15.1, and people in the stable used to call her the “aircraft carrier” because her back was flat and her tail was set very high like an Arab,” Quarles said. As successive generations mature, Wertherson’s reputation as a broodmare sire will also be decided. Already, foals out of Femme Fatale and Autlandisch are bringing home blues and even a licensed stallion! That Wertherson has been influential is unquestionable. But it’s the degree of influence that has yet to be determined. As Tucker-Slaterbeck pointed out, so many of his progeny are just starting their careers, particularly in dressage. “He’s been a great sire,” she said. “And as far as the Hanoverians go, he has surely had an impact. His fillies and mares always test well and show well, and I think he’s left a reasonable mark. Branching out from there, though, I think it will take some time (to tell). 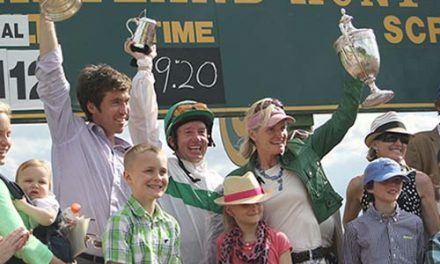 “It was just dumb luck to have tripped over that ad,” Quarles recounted. “I really wasn’t looking for anything.” But she ended up with that “once-in-a-lifetime” horse and in many senses, Wertherson’s saga is just beginning. 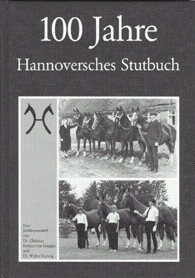 The official book charting the history of the Hanoverians (“100 Years: Hanoverian Studbook) features, in the lower photograph, Wertherson’s bottom line grand dam, the State Premium Auskehr, a revered foundation mare (far left). Also featured in the photograph are Wertherson’s dam, the State Premium Walesca, and his full sister Weltdame, also a State Premium mare as well as a DLG Champion mare. The Hanoverian breed emerged at a time when the role of the horse was changing dramatically in Europe. It origins trace to the establishment of the State Stud of Lower Saxony at Celle, Germany in 1735. According to the American Hanoverian Society, “refining stallions — primarily Thoroughbreds — were crossed with domestic mares to improve the quality of cavalry mounts and farm stock.” Over the years, the Hanoverian breeding program introduced other strains in an effort to create a more athletic riding animal. The result is the modern Hanoverian horse, which is known for its conformation, temperament, and elastic gaits, and its excellence in jumping, dressage, eventing, and driving. Mares undergo similar inspections at age 3 or older. After being evaluated for type, conformation and gaits, they are placed in the various sections of the studbook based on both their overall scores and their dam’s studbook placement. Only the creme de la creme earn the title of “Elite Mare”, and only after successful completion of the Mare Performance Test and having a Hanoverian foal.